Canadian Institute for Health Information. Children Vulnerable in Areas of Early Development: A Determinant of Child Health. 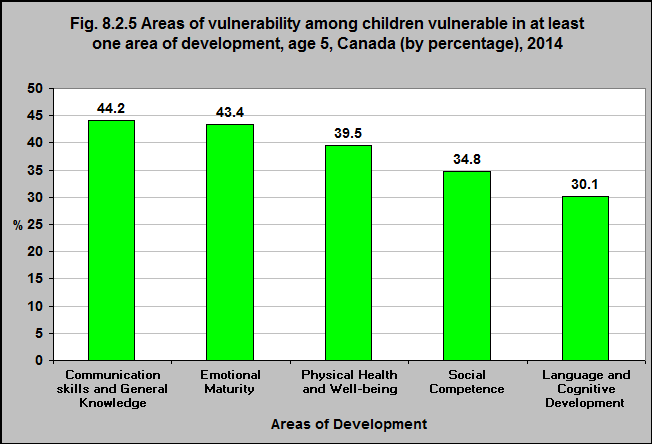 Ottawa, ON: CIHI; 2014.
https://secure.cihi.ca/free_products/Children_Vulnerable_in_Areas_of_Early_Development_EN.pdf – accessed May 22, 2017. The Communication Skills and General Knowledge domain of the Early Development Instrument (EDI)* includes skills to communicate needs and wants in socially appropriate ways, symbolic use of language, storytelling, and age-appropriate knowledge about the life and world around them. The greatest vulnerability among children vulnerable in at least one area of development was in the domain of Communication Skills and General Knowledge. The Language and Cognitive Development domain includes reading awareness, age-appropriate reading and writing skills, age-appropriate numeracy skills, ability to understand similarities and differences, and ability to recite back specific pieces of information from memory. Language and Cognitive Development was the domain with the lowest rates of vulnerability.